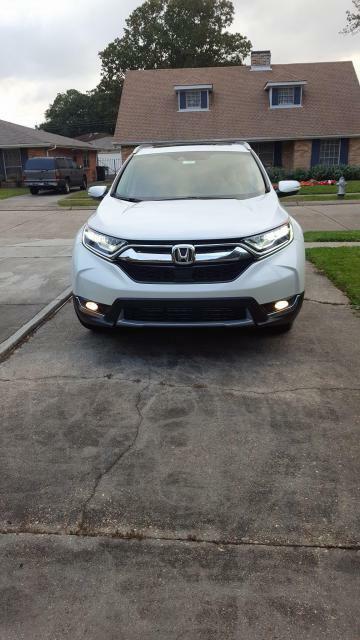 Purchased the new 2017 crv touring today..
Touring chrome trim really makes a difference.. Traded in my 2015 ex-l.. mainly for the honda sense..
That's a great looking vehicle. How does it ride/handle compared to the 2015? Congrats. Did you pay sticker? My wife isn't having any issues keeping up with US 75 traffic on our drive from Ohio to Florida. Her new 2017 CRV EX-L NAV is so full of stuff that I am following her in our 2008 Honda Odyssey which is also full of stuff. At one fuel stop, I had used 9.2 gal and she 6.8 gal in the new CRV. I can never understand the requests for pictures. Unless it's something customized. There are more pictures on the internet then you could ever look at. Want to look at the real stuff? Stop by any dealer. The big question of course...how is the vibration at idle compared to the 2015/2016s? If you have never driven one of them, when the CRV is completely warmed up, at a stop with the car in drive, no accessories at all on (no heat/lights/defrosters/etc), does the car vibrate at idle? 2016 CR-V Touring...purchased April 1st, joke on me for map update due "early April"?